Decades ago at IBM, Tom Bradicich used the metaphorical shrink rays to zap monstrously large computers to an impressively compact prototype of a laptop. 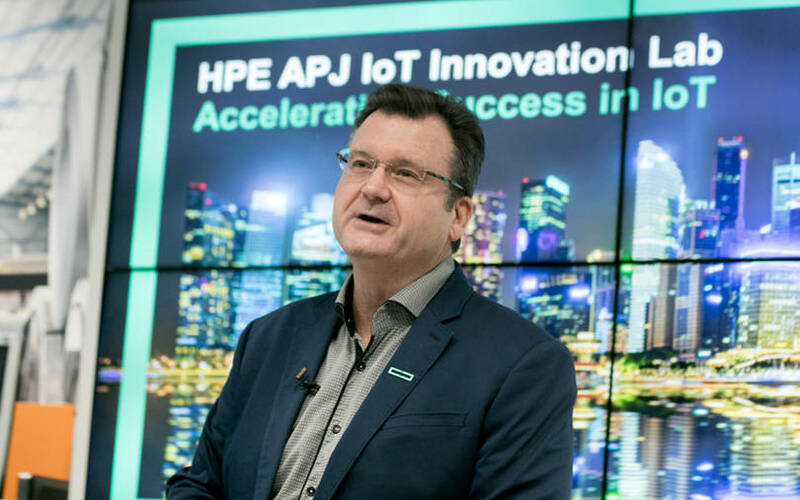 Now, as head of Hewlett Packard Enterprise’s (HPE's) Internet of Things (IoT) and Edge computing business, he’s at it again. This time, he is aiming to shrink monstrously large data barns to a box small enough to snuggle into your self-driving car, and powerful enough to instantly figure out the blob lurking before the vehicle. That means, no shovelling the task to a distant data centre, and then waiting for the feedback. In an interaction with TechCircle, Bradicich said that even large manufacturing plants, oil rigs, and energy utilities are much better off using such tech. We have such unique and valuable offerings in the domain of IoT and intelligent Edge and our focus is on the commercial and industrial IoT. And as you will know, the Indian economy and industries are growing in many, many ways. So, I am meeting with our customers and our partners and some of the big names in the India marketplace. For instance, in Chennai, we are meeting Sify Technologies, which is a partner. We worked with Sify to deploy the largest network in the country, which is the India post office. And the network they are using is the Edge. Most of the infotech is inside a data centre or cloud, the Edge is just not the data centre. It's everywhere else. The fact that the Edge is everywhere else could mean that it is at postal locations. The Edge could be a manufacturing floor of an automobile manufacturer, a water-bottling company. The Edge could be in a tobacco field or crop field, the Edge could be in your home or this room. It's everywhere -- that's not a computer centre or a data centre. It's a very broad definition. So we can envision sensors on all the plates in the cafeteria, that automatically indicate temperature, freshness, and volumes. So, that's a little bit of a futuristic view. How does it work for HPE’s Edge system? How does it give you an edge over others? We're focused more on the three C’s of connecting, computing and controlling. Those are the three C's of the intelligent Edge. How do you make your home or manufacturing floor intelligent? How do you make a military installation or battlefield intelligent? It's the three C’s. Things in a vehicle such as windshield wipers, electric clocks, infotainment system, all those things will be connected -- the first C -- with sensors and actuator sensors. So, if you turn on your windshield wiper, you're taking in data to see if it's working right, so it's a two-way street. And the data we pull from them -- such as does the global positioning system or GPS work? -- all that data is pulled in and we compute and we seek to compute it right there at the Edge on the manufacturing floor as opposed to sending it to the cloud for security, reliability and bandwidth issues. Is the windshield wiper working or not? If it is working, is it running too hot? And then the third C is when we do that controlling in an actuator. The three C's are important. And the uniqueness, as I claimed earlier about the HPE offerings, is that we comprehend all those three things while the other competitors and vendors miss one or two. We bring comprehensiveness, including the partnerships like I mentioned earlier. Let me distinguish ourselves from Amazon. You are correct. Their focus is to send everything to the cloud. Only recently have they followed our lead. The value of sending things to cloud is powerful, and, in fact, we are among the best cloud providers in the world. However, we don't stop at just sending to cloud and add another dimension which we've invented, which is the enterprise-class computing at the Edge. Amazon is starting to follow us because they realise that it's not possible to send everything to cloud. It doesn't mean it's bad. It doesn't mean you shouldn't. Don't get me wrong. We're not against or opposite the cloud. We're the only ones adding to the cloud. Because we invented the converged Edge system. So the converged Edge system is brand new, it's a new category of products. But how do you sell or convince the customers who have just taken to the cloud? There was a day where there was not a laptop. I personally did the engineering on the first laptop computer. So the next day when we were finished, it created a new category. And we literally had to explain why you would ever carry around a computer. So we're in that day now. Why would you ever converge? We're explaining it only to partners, analysts and media, and we don't have to explain it to customers. They understand the value of our invention – the enterprise-class computing for all the data, all in the same box. It is the fastest-growing business segment in the company. We invented the product category of converged Edge system and the brand is HPE Edgeline and, hence, we have the most market share. In the future, when the market is big, we will have competition. Why and how did you think about such a model? Is it because many customers always had a mindset that their data should be in their own data centres? Think about an oil rig out in the middle of the Gulf of Mexico. Why did we put control systems inside the same box? Murphy Oil Corporation is an oil company in the United States that doesn't have a connection out on their oil drilling in the middle of the Gulf of Mexico. It is two things: Enterprise-class computing and storage, and security and management. And it's also the integration of operational technologies, data acquisition systems and industrial networks. Those are things that are not in the data centre, but they're at the Edge. One of them is because many of our customers don't have a cloud connection with enough bandwidth and can't send all the data and also face latency. How fast would you like to know in your autonomous car the object in front of you is a little girl or a garbage can and if you have an autonomous vehicle connected to a network and you rely on the cloud to do all the computing to determine, it could be dangerous. The autonomous cars and trucks will be travelling far and wide, where the internet base is non-existent. You can't send the data to the cloud and come back with an answer by the time that one second is over. And also, if you send all the data to the cloud, it's vulnerable to hostile attacks. The data never leaves the Edge. It is used and processed at the site. Today, nobody will buy a GPS device, camera and phone because a smartphone integrates all that. We integrate all the functions into a single device. Similarly, with Edge also, you have convenience. Does that restrict the real potential of the market? Only those who are paranoid about sending data to the cloud or with a patchy network connection will opt for it? You missed the point of convergence. If you want to pay for bandwidth, you don't need that product. If you have enough bandwidth to send terabytes of data, you don't need the product. Sometimes, there are companies that have data sovereignty, geo-fencing policies, where they can't send the data from their site to cloud, especially in the defence sector. There is a huge market for cloud and we have great cloud solutions. Sometimes, Edge works as a temporary or parallel system if an organisation is not sending data every day. Or if the network goes down, that might not be every day… But what if something happens? What if you control your manufacturing line in your cloud, a connection goes down or is intermittent due to a storm? You want to keep your manufacturing line running. We allow autonomy from the cloud when it's needed. There are so many ways to do this. It is like the hybrid cloud model but still not like a private cloud that could still be far away and you need bandwidth and you cannot wait for the latency. But with cheap data, upcoming 5G (fifth-generation cellular standards) and proliferation of data centres and content delivery network companies, is that a big issue? Some are producing more data than their bandwidth to the cloud can handle. The Large Hadron Collider in Geneva generates 40 terabytes of data in a second. There is the issue of reliability. It could be mission-critical to the business to prevent loss. How soon do you want to know and the manufacturing line is pumping out 100 defective products every few seconds. How difficult is it to convince the customers? No, I don't have to convince them, they come to me. Seagate, the hard drive maker, is using our systems because they have so much data. They're taking images of their product to identify defects. It takes a long time to download pictures and videos. That's big data. The longer they wait to find the answer, they have to slow down the line. And remember, in manufacturing, you want to keep moving. We invented this based on customer feedback. Today, everybody talks about it. We realised that there's so much data and it can't go to the cloud. How big is the market for you globally? What are the revenue numbers for your division? My business unit grew 197% year-on-year. So that's a number we've disclosed. When you create a new product, you converge things together. You also have to change your sales approach. You have to change the way you do interviews with the media, you have to change the way you do partner interaction. You have to create a whole ecosystem of channel delivery and partners because that used to be separate.